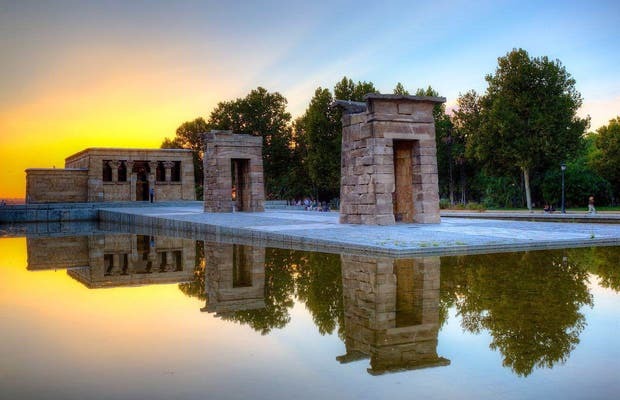 The Temple of Debod is an ancient Egyptian royal temple in Madrid. It is over 2000 years old and is made of blocks of stone removed from Egypt. When, in the mid-20th century, the Egyptian government decided to build the Aswan Dam, they made an appeal to UNESCO to give this temple back to them, as otherwise they would sink into the waters of the Nile. Spain was one of the countries that responded to the call and in 1961 the temple was dismantled but not it wouldn't reach Madrid until 1970. When it was at its best, in addition to the main chapel (dedicated to the goddess Isis), it had two walls that surrounded it but currently only the pillars at the doors survive. From there you can walk to take the tram way for the best views in Madrid or walk to the Sabatini Gardens or even the royal palace. Plaza de España is almost across the street but it needs updating. Totally recommend going during sundown . Amazing views of Madrid and mostly because of the sunset! Perfect place to take a photo of sunset from and to take a rest during hot day. A present of egiptians, it stands at a magic place in the city looking in great views. To see both the sunrise and sunsets, to work out, just play or relax.